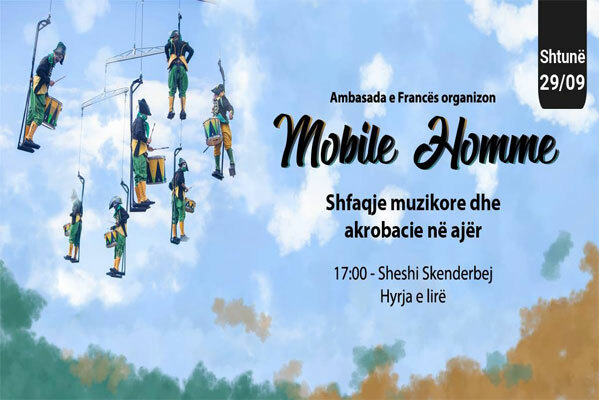 For the first time in Tirana, we invite you to join with your children the musical show and acrobatics in the air, in "Scanderbeg" square on September 29th, at 17:00 -18: 30 o'clock. Imagine this human mobile suspended above water, from a cathedral's spire or in the night sky... The off-beat rhythm brings the drummers to the frontline. At the end of the line of lead drummers comes a character a bit out of place, called the "Pignouf", who prefers flirting with the spectators... It's only once the mobile lifts up that we discover that under this clowny character was hiding a beautiful trapezist.